Let your fingers guide you with the HTC Touch(tm), the world's first phone to feature intuitive touch screen technology. 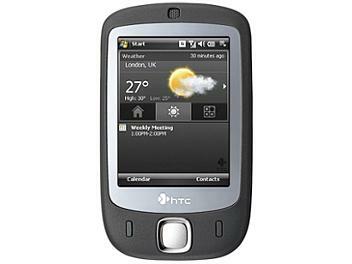 Featuring an easy-to-use touch screen and simple user interface, the HTC Touch with TouchFLO(tm) makes quick dialing, navigation and selection a breeze. Stylish, smart and versatile, it opens up a world of media, communication and social interaction. Surf the Web with Internet Explorer(R), send and receive email from accounts like Hotmail(R) and Yahoo!(R). Chat on Messenger and send photos to your own Web space through Windows Live(tm). Optimized for entertainment, the HTC Touch lets you enjoy your favorite music and movie clips through the integrated media suite. You also have the versatility to upload, store and share your media files with microSD(tm) removable memory. With Windows Mobile(R) 6, the HTC Touch also provides instant access to your Outlook(R) email and the most popular Microsoft(R) Office applications. Experience a whole new sensation, the HTC Touch.